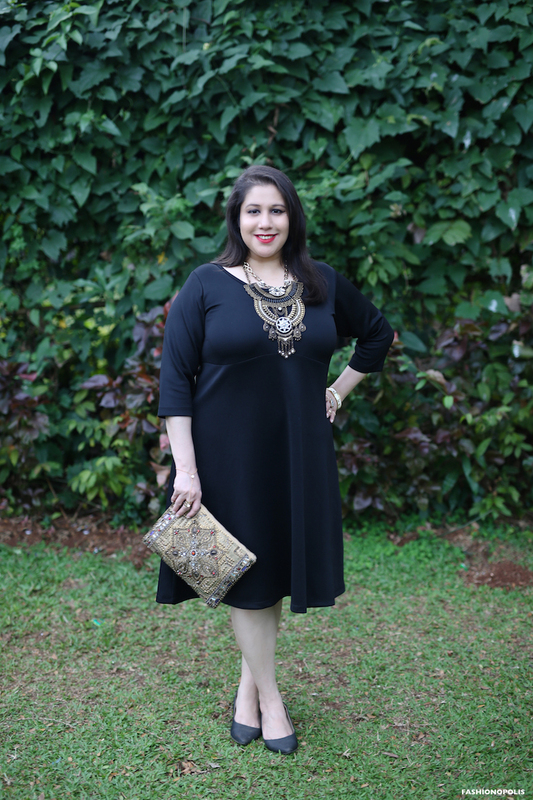 Plus Size Fashion | Go Glam Or Go Home! I love December! It is hands down my fave month of the year. Not just because it is my (and my mother, father and kid brother’s) birthday month but also because everything around is bright and sparkling. The cool air is full of life, people are in high spirits and everyone is in a merry-making mood ready to bid adieu to the year gone by and to say hello to the new one awaiting us. While the year may be coming to an end, the party season has just begun. Nothing says holiday and festive glam quite like glitter and bling. 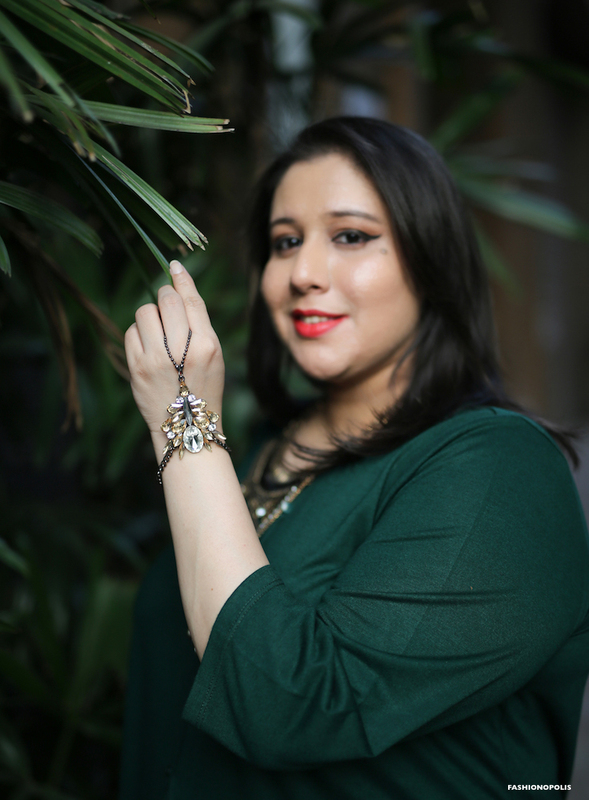 As someone who loves both these things, any occasion is good enough for me to flaunt my treasured statement pieces and baubles. While styling festive bling and party glam one needs to be mindful of not getting carried away and going over the top. If not careful, a look can go from tasteful to tacky in a heartbeat. 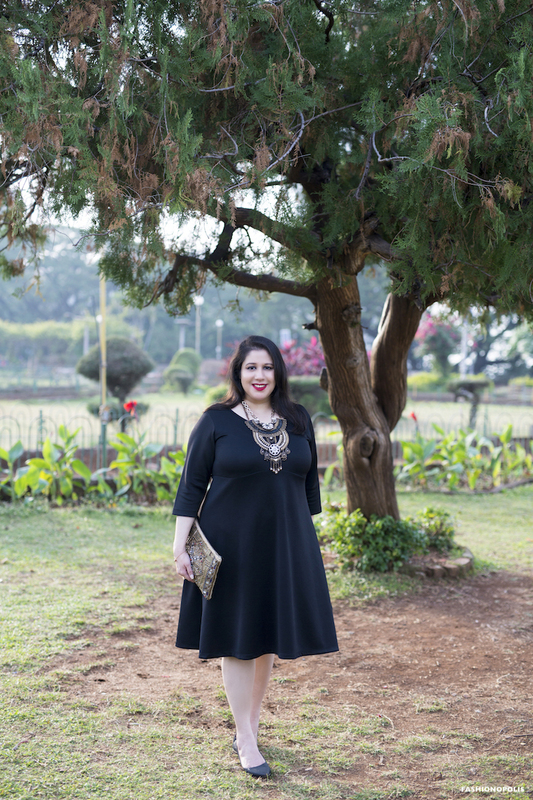 Like most women around the world, my party season staple is a little black dress as well. 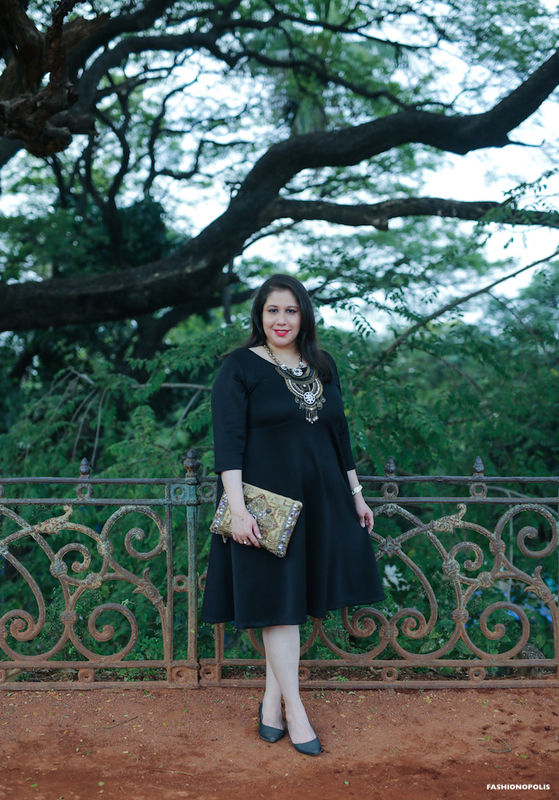 Depending on the occasion, the LBD can either be glammed up or down. Taking a break from shifts and shirt dresses, I got myself a black skater dress from Amydus. I’ve always wanted to try out this silhouette and the festive season seemed like the perfect time to try it out. The dress is a quintessential LDB. It can easily be glammed up or kept simple and chic depending on the occasion. Since I wanted to wear the dress for a friend’s cocktail party I decided to style my look with gold accessories. The classic combination of gold and black with a hint of red colour pop can never go wrong. I am a huge maximalist who strongly believes in go big or go home. 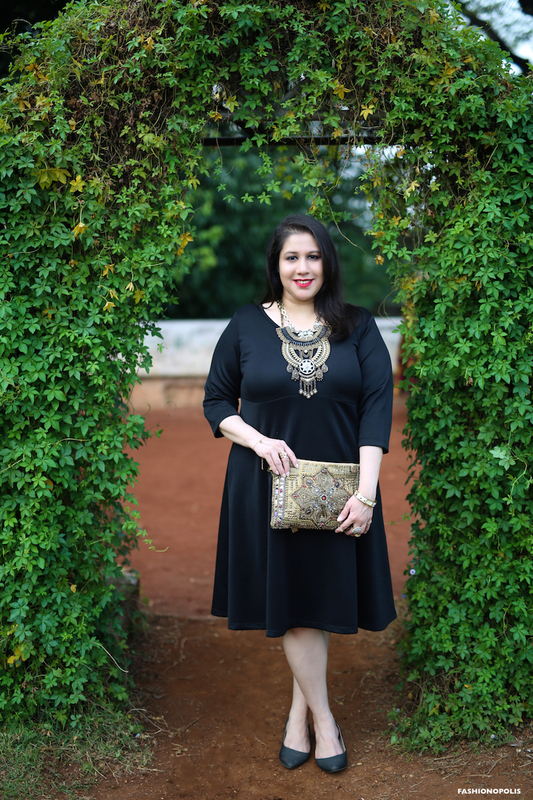 Not one to shy away from larger than life statement accessories, the LBD was the perfect companion to complement my bejewelled necklaces and embellished clutch. The simplicity of the dress balanced the dramatic accessories, creating a sophisticated and eye-catching look ideal for the party season. As we say goodbye to 2017, here's wishing you all a splendid and wonderful Happy New Year. May 2018 be your year. “Where do you buy your clothes from?” – This is one question that I get asked on a regular basis. Considering the lack of availability and easy accessibility of quality plus size fashion in India, this question doesn’t surprise me at all. However, what does surprise and bother me is how so many Indian brands still ignore the needs and demands of over 50% of the nation’s population. 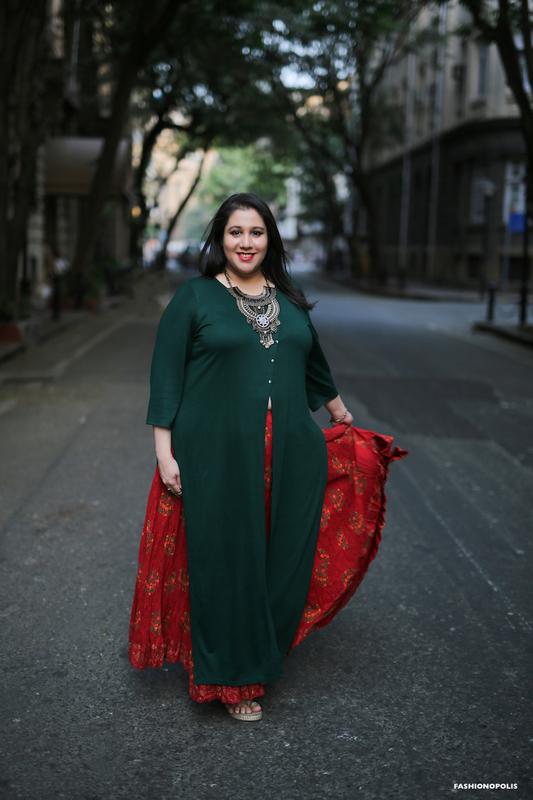 Even though a large number of Indian brands still don’t have a size inclusive and body positive approach, there are a handful of brands that are making the effort to create stylish and affordable clothes for plus size women. Along with making clothes, these brands are also helping build the confidence of many women who have struggled with body issues due to lack of clothes and mainstream representation. Personally, I’ve always struggled with finding clothes my size. However, this issue became even more obvious when I started fashion blogging. When a large part of your job depends on creating new looks, the lack of clothes can hamper your career. And to a large extent this has happened with me. It was only around late 2015- early 2016 that ready-to-wear plus size clothes were noticeably available. 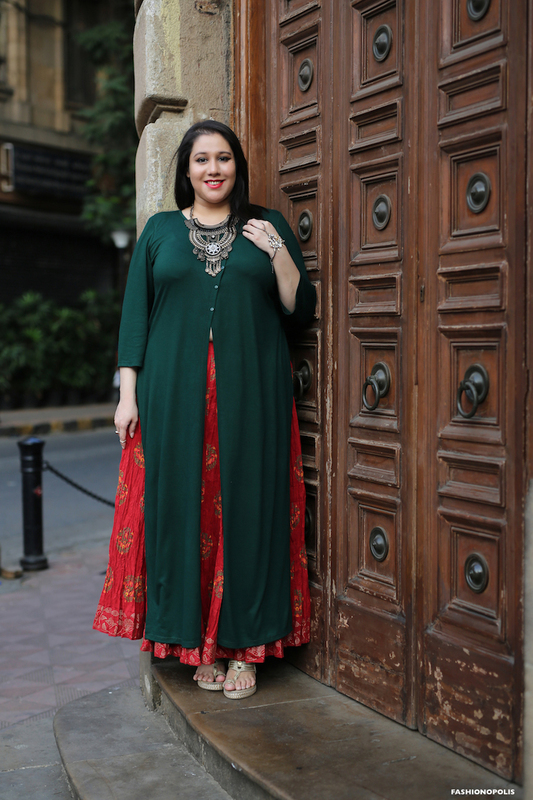 Unlike straight size women, we plus size women are not spoilt for choice. Therefore, it is very important to invest in clothes that are easy to mix-and-match and layer up. 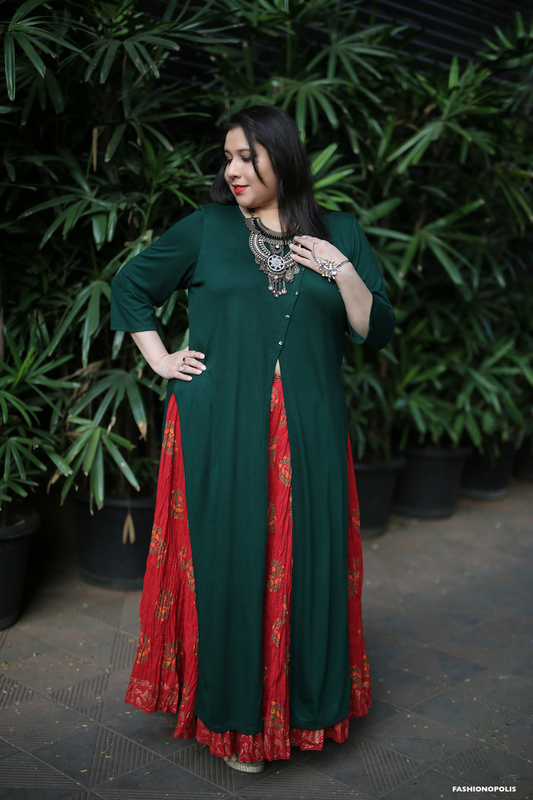 Amydus is one such brand that offers a wide variety of pieces that have great styling and layering potential. 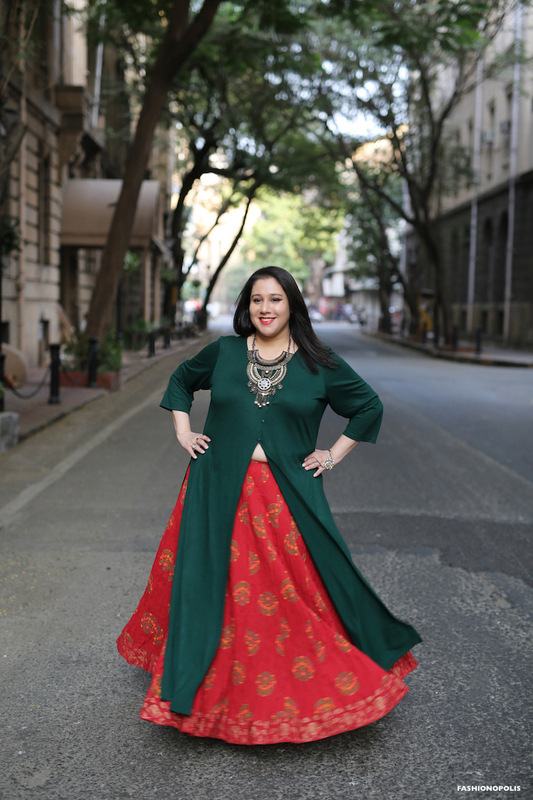 Plus, the brand has figured out Indian sizing and what works for Indian plus size women. From Indian wear to party wear and formal wear, there is something for every occasion. I love wearing dress, but I was never a fan of belted dresses. I really liked this check shirt dress and was not letting the belt stop me from buying it. When I got the dress, I was planning to style it without the belt. However, the dress did not have the same impact without the contrast accent. I purely wore the belt for the colour pop. What surprised me the most was how the belt helped accentuate my curves and give a better structure to the dress. The belt completely changed the look of the outfit. 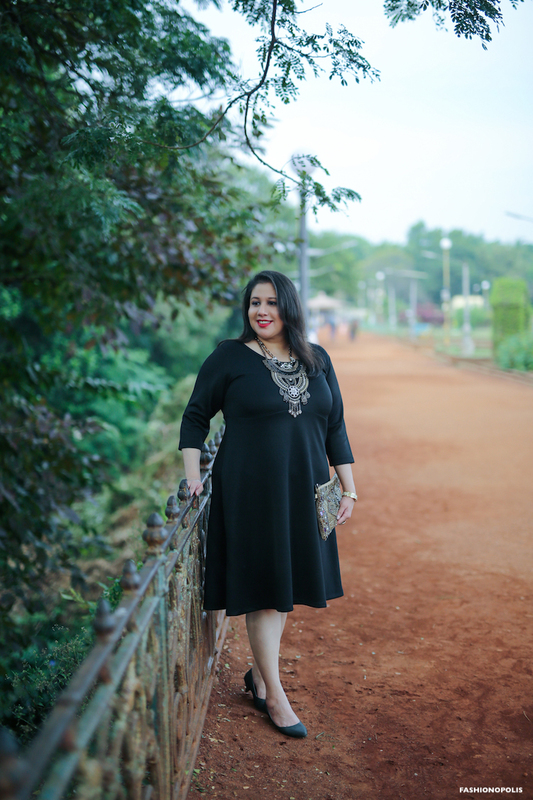 With winter season finally arriving in India, wearing layers without the fear of breaking into a sweat inspired me to layer the dress with a denim shirt. The denim shirt gave the look a beautiful colour contrast without dominating the dress. Both these pieces can be worn separately as well as can be used to layer. In fact, most pieces with front buttons can be used as a layer. That is why I prefer to invest in them. In a year full of trying out new styles and taking sartorial risk, this belted check shirt dress is another one to add to the grown list. Wedding season is here – and it is here in full swing. This year I decided to change things around. Instead of going with traditional silk and embroidered pieces, I wanted to create a few looks that are not heavily embellished but still have a rich and luxe look. 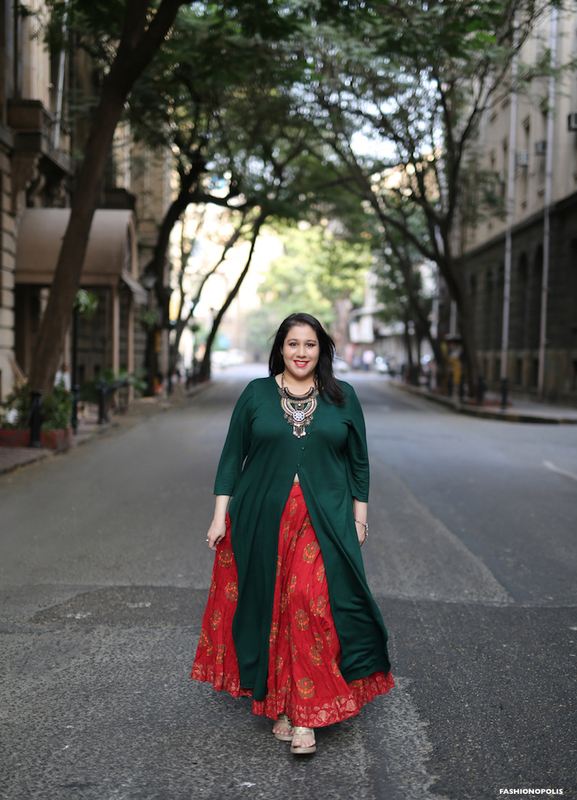 Plus, unlike traditional Indian wedding wear that can’t be repeated frequently, I wanted to invest in something that would be multi-occasion friendly. 2017 has been my year of stepping out of my style comfort zone and taking sartorial risks. 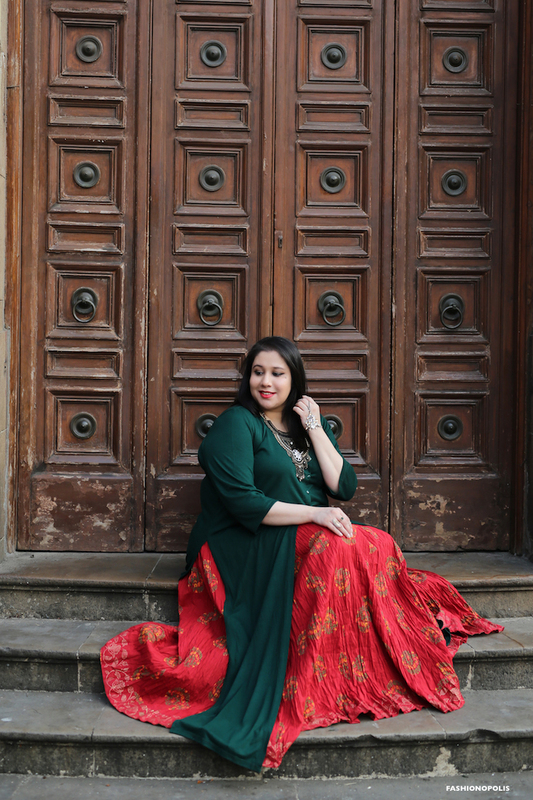 One of the main reasons why I was able to do that is because of the growing plus size fashion industry in India. Brands are finally understanding the needs of plus size women and realising that we too deserve stylish and trendy clothes. 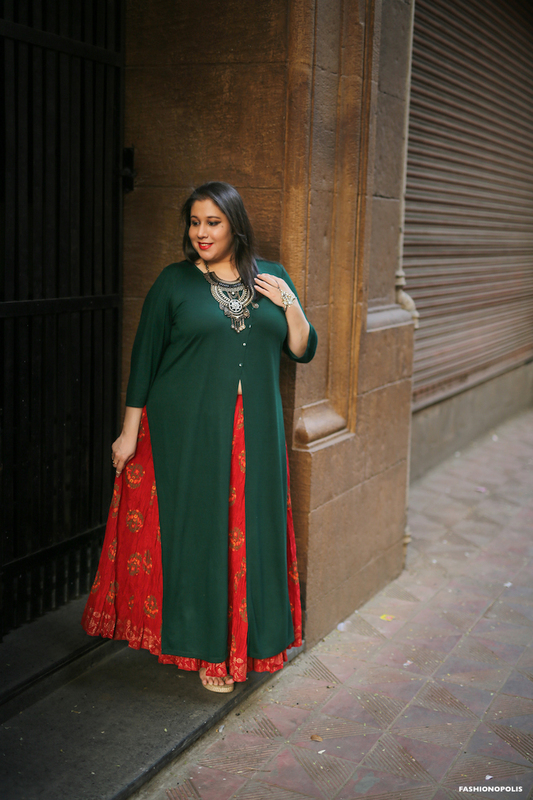 I was able to make a drastic change to my wedding season wardrobe mainly because I was lucky to find on-trend and chic Indian wear pieces. From pretty prints to stylised silhouttes, Amydus has wide variety of tunics. While looking for something that is is both classic and at the same time statement making, this front slit, overlap tunic in deep green shade caught my fancy. It was unlike any other tunic I had seen in a while. However, as much as I loved it, I was not sure if I was ready to wear something that draws attention to my belly. As a classic apple shape, plus size woman, I have always been very conscious of my non-flat belly. While I’ve finally made peace with the way my belly looks, I still haven’t reached the point where I am comfortable showing it. I decided to finally take the plunge and get myself the tunic. I won’t lie - until I got the tunic in my hand I was a tad bit apprehensive and nervous about my belly showing. However, once I wore the tunic, I realised that all the nervousness and doubt was in my head. There was nothing wrong with my visible belly. 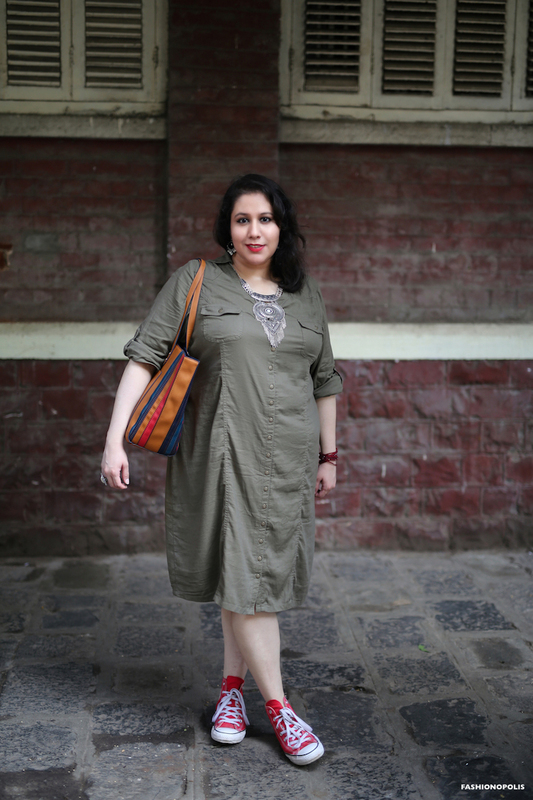 Like some women are fair skinned and other are dusky, some are tall while others are short, similarly, some women have a flat belly while others, like me, have non-flat, round belly. And that is just fine. Women come in all shapes and sizes, and so do our bellies. We should not be ashamed or asked to hide our bellies just because they are not flat or washboard abs. 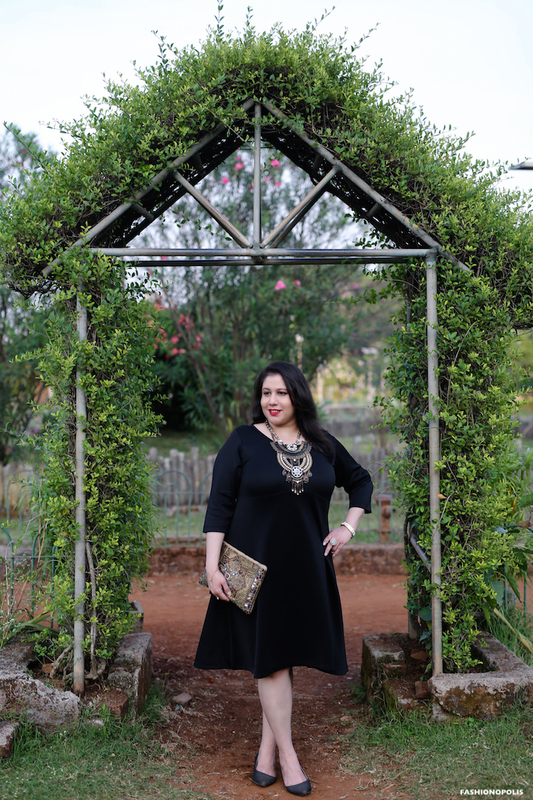 The Amydus tunic turned out to be a very wise and body positive investment for me. Not only did I get a new style and silhouette to add to my wardrobe but I was finally able to let go of my inhibition and get comfortable with my non-flat, round belly showing. I’ve to be honest – I’ve never been one of those who invested too much time and energy in my skin care routine. Partly because I have oily combination skin, and partly because I’ve never found any products that really made much difference to my skin. However, since I turned 30 I’ve been more careful with my skin care. While I haven’t made it a habit to buy every new product that hits the market, increasingly, I’ve made an effort to try out products that may work for my skin type. 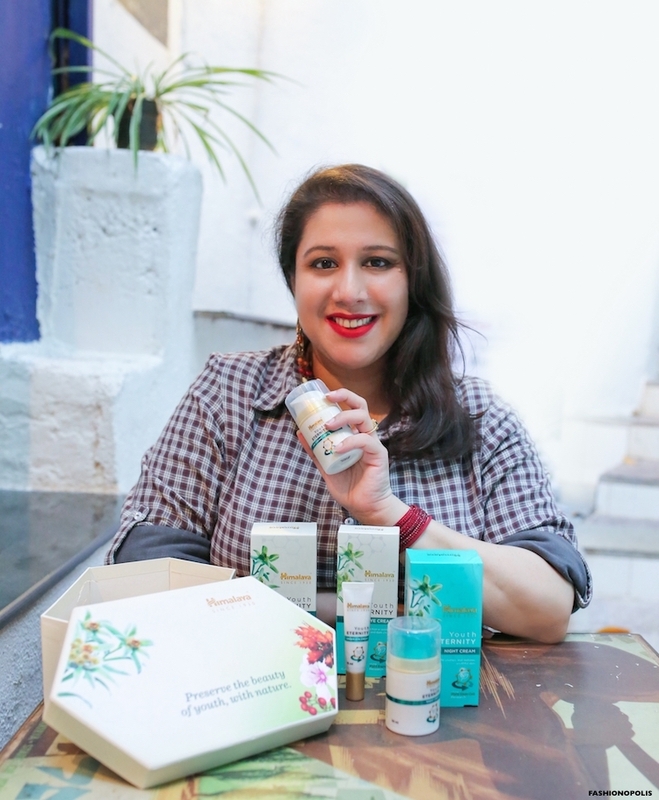 No stranger to Himalaya products - I swear by their anti-dandruff shampoo – I was quite keen on trying out their new Youth Eternity Range. When it comes to quality and price point, Himalaya has been consistent. Staying true to its core philosophy, Himalaya has always been nature-derived, finding the best of nature and creating products that are natural and pocket friendly. Himalaya's newly launched Youth Eternity range has been specially formulated using stem cells from the Edelweiss Plant. The stem cells are combined with herbal active extracts of flowers like Rose Myrtle, Fire Flame Bush, Woodfordia and Cipadessia Baccifera, to hydrate and regenerate your skin. The range consists of day cream, night cream and under eye cream. I’ve been using all three products for over 2 weeks now and I’ve gotten positive results. As someone with very oily and combination skin, I found the creams, especially the night cream to be very effective. The Himalaya Youth Eternity Day Cream has a light and non-greasy texture. It gets absorbed easily into the skin without leaving an oily residue. For my oily combination skin type, the day cream provides me with adequate hydration without making my skin look shiny. Himalaya Youth Eternity Day Cream comes with SPF 15 and is priced at ₹499 for 50ml (Also available in 10ml & 20ml size). Compared to the day cream, Himalaya Youth Eternity Night Cream is richer, offering more nourishment. Like the day cream the night cream too has a non-greasy texture. The night cream works overnight to provide intense hydration, reduce fine lines and wrinkles, leaving your skin even-toned and healthy. Himalaya Youth Eternity Night Cream is priced at ₹499 for 50ml. Unlike most eye creams that are rich and heavy, Himalaya Youth Eternity Under Eye Cream has a very light texture. It is almost like a gel-cream that is rich in anti-inflammatory properties that nourishes and hydrates the tender skin around the eyes, helps reduce dark circles and fine lines. After using the under cream for over 2 weeks I’ve noticed my under eye region looks more bright and healthy. Himalaya Youth Eternity Under Eye Cream is priced at ₹525 for 15ml. What I liked the most about Himalaya Youth Eternity Range is, that all the products are packaged in a travel friendly manner and all of them have anti-inflammatory properties. All three products in this range have stem cells from the Edelweiss plant and extracts from exotic plants and herbs. Plus, all the creams have a rich texture but neither of them leave an oily or sticky residue. The best part about this range is, the products are free from parabens and phthalates. If you are looking to start an anti-aging skincare regime, The Himalaya Youth Eternity Range is a good one to start with. These products can easily be used by women in their 20s, 30s and 40s. Ideal for all Indian skin types and Indian weather, The Himalaya Youth Eternity Range is for every woman who is aims to have healthy and glowing skin.